The number of homeless people going to A&E has tripled in the last seven years, an investigation has revealed. Almost 32,000 emergency visits were recorded in English NHS hospitals last year, up from 11,000 in 2011. A 15-fold increase was noted at one hospital trust in central London, while many parts of the country have seen their numbers rocket 500 per cent or more. Experts say the use of spice and other strong drugs, fewer preventative health services and a lack of social housing could be to blame for worsening problems. The British Medical Association uncovered the figures using Freedom of Information requests to hospitals around the country. Admissions onto hospital wards through accident and emergency departments also rose 175 per cent, from 3,378 in 2011 to 9,282 in 2018. 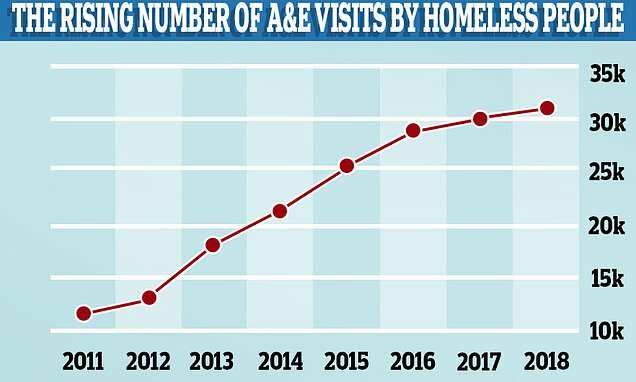 More than a quarter of GPs also said in a survey they had seen an increase in the number of homeless patients during the past five years. And homeless patients' medical problems are become increasingly complex, making caring for them extra difficult, experts say. 'If this was some disease causing all these problems it would be a much higher priority,' said the BMA's public health medicine committee chair, Dr Peter English. 'But because victims can be blamed and stigmatised it is easy for Government to ignore. 'The growing numbers of rough sleepers and vulnerably housed people in our society is a continuing tragedy.